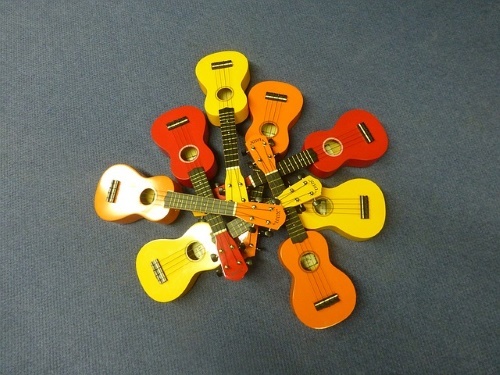 Six string ukuleles – as their name implies – have 6 strings instead of the usual four in usual ukulele types. This special ukulele is a must-have if you are an experienced ukulele player and like to have a richer sound experience. You will know what to consider before buying a 6-string ukulele. Its distinction with other types of ukuleles before knowing the best brands. This way, you will be able to gauge for yourself whether or not this instrument is the right one for you. If you are ready to buy a 6 string ukulele, you might probably wonder which ones are the good ones from the bad. Sometimes, even if we buy popular brands, we also end up with poor instruments. 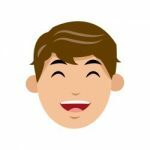 In order to avoid such embarrassment and disappointments, here is a list of recommendations from various people all over the globe. Below you can find what they also think are the good and bad points of each product. Eddy Finn EF-G6 Tenor 6 String Ukulele comes with a free 30-minute lesson that you can do either at home via Skype. Its frets are made of nickel silver which gives it a rather distinctive look and feels. The vintage matte satin finish makes the grain of the wood pop and gives it a good amount of resonance and volume. This also features Aquila strings that allow it to have a sweet note that you will surely love. Eddy Finn does not disappoint when it comes to their products even if they are fairly new. This 6 string ukulele is something to admire whether it be through its sound or looks. Do note that if you may buy this product, it may be set up backward so you may have to re-string it. 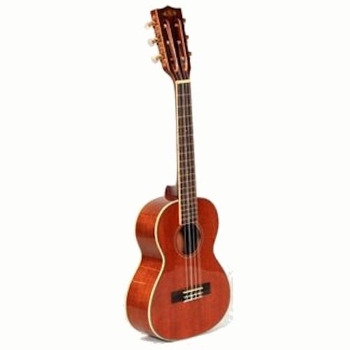 Kala KA-6 Mahogany 6-String Tenor Ukulele only weighs about almost 2 pounds, which makes it a lightweight product. This instrument offers full-bodied sweet tones that are very pleasing to hear. The nylon strings are held up by the chrome die-cast tuners which always stays in place. Furthermore, there are traditional white bindings that are featured on the top and back accent of the instrument which gives its polished look. This instrument requires some help to help it stay in tune for a long while, which is the usual case for most ukuleles. However, the overall look and sound of this product should be enough for you to buy it if you want a versatile ukulele. Luna Tattoo 6-String Baritone Ukulele has a chrome hardware that is very hardy and easy to clean. Alex Morgan designed the henna design of this ukulele that people will find very appealing. Its 5x8x30 inch size is easily portable and you can stash this ukulele at any place you wish. It comes with a Luna bag with every purchase which you can also use as a means of storage when you are not using it. Remember to store this ukulele away from moisture as this instrument’s top is made of spruce. This is worth investing for because it comes with a gig bag that you can use for your convenience. Be sure to tune it before you play it in order to get the best results possible. 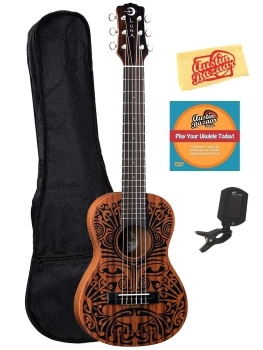 Luna Tribal 6-String Ukulele Bundle comes with several accessories that you can use whether or not you are new to this instrument. It features black tribal designs with a satin natural finish for a sleek and unique look. The tuner it comes with is very easy to use and will help keep your ukulele in tune whenever you use it. Furthermore, the instructional DVD included is useful for players who are transitioning from 4 string to 6 string ukuleles. Consider buying this product if you are a beginner ukulele player who is transitioning to become an intermediate player and want to play 6 strings. It comes with a lot of accessories that you will surely be able to use. Oscar Schmidt OU26T Ukulele only weighs 3.65 pounds, and this weight is perfect for balance and feels without feeling too cheap. Unlike other models of ukuleles out there, the parts are all made of mahogany save for the fretboard that is made of rosewood. This uses Aquila strings which will give it quality sound that you will enjoy whenever you play the instrument. It has chrome tuners that are durable and are very attractive to look at and does not rust. This instrument performs fine and has a good sound if you use the right strings. Though it is a little hard to tune because it uses Aquila Nylgut strings, it will loosen up eventually. This way, it can deliver the sound you want. You may find that 6 string ukuleles are definitely easier to play with if you are an experienced string instrument player. This is because it mimics the usual number of strings in a typical stringed instrument. However, you should first know these things before you buy a 6 string ukulele. This is so you do not regret your decision. Moreover, you will not waste your time and resources having to buy a product that may or may not be for you. Skill Level – Stay away from this instrument at all costs if you are still a beginner at playing the ukulele. This is because it requires at least an intermediate to an advanced skill level of playing the ukulele. This requires picking on the strings of a 4 string ukulele, which you should be able to master eventually. You should also be able to know how to tune a multiple string instrument. Additionally, you must also know how to string a ukulele because it will require a different kind of strings from guitars. Patience – This is a rather tricky instrument to master because it has double strings on the 1st and 3rd Thus, the result is a distinct voice that you will not find in any other ukulele type. If you are not able to hear and play this properly, you will have trouble finding the sweet spot of this ukulele. Finding the sweet spot takes time when you want to be able to play it smoothly. Sound Range – Six strings mean can mean more playability, and this means a fuller sound range if you know how to play it right. This is because the extra strings can be tuned an octave lower in order for you to add more depth and layer to the sound. 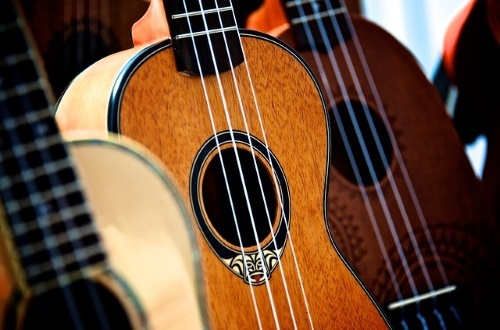 If you want a more basic tone, then sticking to a 4 string ukulele is better for you. However, if you want more flavor to your tunes then this is a great way to add to your musical journey. The difference from Guitalele – You may think that they can be interchanged whenever you wish to play either instrument because they look similar to each other. The guitalele also has 6 strings but is tuned and strung differently which means it should be played differently as well. This is something you should consider if you are buying a 6 string because you might end up confusing the two. Furtermore, note that 6 string ukuleles will always be tuned to GCEA, and guitaleles play ADGCEA notes. Overall, you will find that 6 string ukuleles have a better sound than 4 string ukuleles if you find the right product. No instrument is perfect even if the production is the same. There are different things that give its distinctions from one another. This is the reason why there are some cons that some buyers will notice upon purchasing these items. However, this should not make you avoid the product.